Remember Tara? Derek? Paul? Albert? These are just a few of the Mark’s Daily Apple readers that sent in their success stories a year or more ago. Their stories were an inspiration to us all. Testament to this fact are the emails I receive from fellow-PBers asking how they are doing. Today we find out. You may recall that when Tara sent in her story at the end of 2010 she had been Primal for a year and a half, and had finally found solutions to a litany of health issues that doctors couldn’t. Derek had ditched grains and in the process lost weight, acid reflux and exercise induced asthma. Paul had gone from 300 to 150 pounds and gained self-confidence. And Derek had gone from 270 to 175, and was studying to be a personal trainer. Are they still Primal, happy and healthy? Read on for updates from each of them. I hit my lowest weight of 135 lbs late last year and have since been in a maintenance phase, experimenting with what my body performs best on and what I can cheat with. I found that being 135 was actually too low for me – a problem I can honestly say I have never had before in my life – so I started eating breakfast occasionally, eating rice in small quantities, increasing my dairy and allowing myself chocolate more often than before. Basically, I undid all the “tweaks” I had done to lose that last 10 pounds. I’m back up to 145 lbs now and feel great. I had been considering plastic surgery to deal with some of the loose skin on my body, but gaining a little weight back has taken care of that issue naturally. I’ve also been dealing with fructose malabsorption. This issue has been a tricky little devil. Things like carrots, apples and artichokes are now off the table, as are coconut flour and coconut milk. I’m not sure if I’ll have to abstain from these foods for the rest of my life or just until my gut heals, but the more I research the issue, the more I see that it is pretty common for a condition that no one has ever heard of. I’ll be doing a post about it once I have some definitive answers for myself. I still blog at www.primalgirl.com. I recently had a couple posts about a nasty autoimmune condition called Hidradenitis Suppurativa that I managed to put into complete remission. The response to those posts has been overwhelming. I’ve been receiving comments from all over the world – not only are people grateful to finally put a name to what they’ve been suffering from, apparently my website is the only place on the Internet that provides constructive instructions on how to deal with this skin issue naturally. Most doctors don’t know how to diagnosis it, let alone treat it. I continue to biohack myself and remain committed to the Primal lifestyle. I recently started up a Primal Meetup group to get together with some of the wonderful people I met at PrimalCon and to meet others also following this lifestyle. It’s been wonderful connecting with people in real life. I still remember how I used to look, feel and perform before I went Primal and I can honestly say, I’m never going back. I recently took a road trip out to New Mexico. Had to stand on a corner in Winslow, Arizona. With Orleatha Smith at PrimalCon 2012. Read Tara’s original Success Story here. I think I sent you my initial story about two years ago? Anyway, if I recall, my wife had just become pregnant then. The pregnancy went great, no issues. She gave birth to our son almost one year ago (June). The birth went well and our child was born healthy, with the standard struggles of a new mom learning to breastfeed. One year later my wife is at her pre-pregnancy weight and fitness, with no struggles to lose the weight gained during pregnancy at all. I have maintained my weight and put on a bit of muscle just from doing less cardio (too busy to ski all day long), and spending more time lifting when Alex naps. I still don’t have any of the exercise induced asthma that I used to suffer from, which was my biggest health improvement from ditching the standard American diet. We spent last winter skiing all the time with Alex. I think I skied about 50-60 days with the little bugger on my back, both nordic and backcountry, so that was great exercise! Now that spring is here, he’s in the bike trailer and we drag him around every evening. Thus far he’s pretty much spent every day, outside, in the mountains. He loves it, you can see it calm him down if he’s been cranky. Since I contacted you two years ago, we’ve continued to eat “Primal”, making an effort to eat a wide range of high-quality, whole foods. We are not carb phobic in the slightest, in part because we are both active. Over the past few months, I have also started soaking/sprouting/fermenting buckwheat groats to make incredible “fast food” such as crepes, waffles, burritos, and pizza crust. We still don’t eat any sort of cereal grain, and neither my wife nor I have any desire to. Interesting though, the pressure people put on you when you tell them you’re not feeding your child little bits of highly processed baby snacks and all the other garbage made for babies. The pressure got heavy enough that my wife started to cave in a bit, then we discussed the meritless advice, and went back to feeding our youngster real food. Anyway, our story wasn’t that dramatic, but I really think changing our diet is what helped my wife to finally get pregnant. We are both convinced of it. On that note, I am back in school working on a graduate nutrition/public health program. I’m hoping to transition out of ER nursing and work in obesity counseling in some capacity. Hopefully one day I can lead more people to this “way of life”, which I don’t necessarily call Primal. I like to think of it as living like your great Grandma did. Eat real food from good sources, move more, stress less, cut back on all the extra “stuff” in your life, simplify, sleep, hang with family. I think your website, and some of the other big bloggers, are doing great things. You are raising awareness on nutrition and health, but also equally important, on lifestyle changes to improve health. Too many messages out there don’t include the entire package, your message does, and that is what makes it so valuable. I’m sure the message will continue to evolve as we gain more insight, but I hope the message keeps getting out to more people, because it’s a profound discovery once people find it. Read Derek’s original Success Story here. The last time we spoke I was going through very comprehensive knee surgery and working on getting my fitness back after a six month rehab. Shortly after that, near the end of 2011, myself, my brother, and our friend started a software company for our app Out of Milk and we ended up moving to San Francisco to get the company going strong. This has led to certain challenges, as trying to eat a clean diet in a city that loves it’s carbs and sweets makes it difficult when your life revolves around working lunches and meeting people for drinks and food! Luckily, there is an amazing Primal San Francisco Facebook group that helped me find the places I need to get my diet back on track. I’ve discovered the grass-fed meat scene is actually quite large here, and I’m enjoying a great selection of tasty animals! I’ve been a CrossFit fanboy on the MDA forums for a very long time, and after weeks of fighting it… I gave up the sport. I found that for me, personally, I was pushing my body too hard too often and not giving myself enough time to rest and recover to perform at both the gym and at work. I’ve since started training using a combination of kettlebells, pullup bars, rings, and a rowing machine. I love Brazilian Jiu Jitsu and by slowing my training down to a method less intensive on the body I’ve found that not only is my strength increasing but my ability to go into BJJ and not be sore, tired and achey is vastly improved. 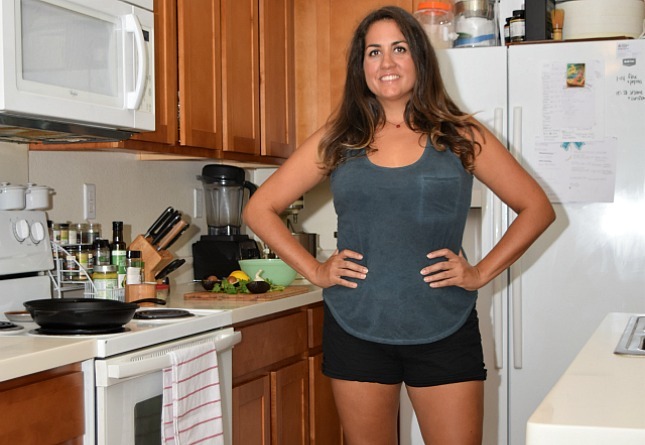 When we first moved to SF I actually put on about 10 pounds while exploring all of the amazing restaurants, and once I realized what I was slipping into I immediately started focusing on meals from the Primal Blueprint Cookbook(s) and in less than a month was back on track to my normal weight. I thought giving up CrossFit would immediately turn me into a fat slob, but I guess all the articles you’ve written about not having to kill yourself while exercising really were true! To sum things up: Lots of life changes, a completely new workout regimen, and still working on getting my knees back under me… but I’m getting work done, rockin’ the bjj, and eating lots of meat and that make’s life pretty great. Oh yeah, and in case you want some pictures! The first picture is a random shot from our first day in SF! The second picture is myself, my dad (used to be a professional gymnast and is nearing 60), and my brother who is now down almost 100 lbs total. Read Paul’s original Success Story here. It’s been a while yes! Hope you are doing well. After writing you back in February last year I focused on learning as much as I could about nutrition, biology and sports science, let’s say it just got me hooked! I am now working as a Personal Trainer and Nutritionist in Spain and still eating Primal of course! Having experimented a bit with carb intake I can safely say that while your carb intake curve is more than accurate for most folks, advanced trainees may need a bit more to perform well. What has worked for me was limiting nuts (those omega 6’s can really get you inflamed) and getting my carbs from potatoes, fruits and yams (sometimes a little quinoa goes well with meat). I’ll leave you a pic I had taken while enjoying some time outdoors in this lovely weather! As always, many thanks for encouraging people to improve themselves and to strive for better health and a better life altogether! Read Albert’s original Success Story here. Way to go, inspirational as always. Today is my last day in Banking after 10 years and going primal was the key driver for me to quit office work to do what I really want to do… because life’s too short to live like a zombie. Kudos to you! I agree that after following MDA…I’ve started to think about a lot more about finding the ideal job. Which for me involves not being behind a desk and working with my hands. Same here my Man. Going primal has inspired me to follow my passions. I’m an entrepreneur for life! That is awesome and inspiring! Good luck! Good move, follow your bliss! I’m amazed and heartened to hear this chorus–I thought it was just me! Seems like the Primal move got me more in touch with my deeply personal drive. “Know thyself” and then act on it with strength. Good luck and perseverance to all. Wow good for you! I agree with you. I am a graduate student, but have a passion for yoga. I decided to start a yoga teacher training while still in grad school because going primal inspires me to do what I really want to! What are you going to do now, Patrice? Let’s be honest, I could not be doing all that with a 5 months old if I’d not found MDA and ways of maximising my energy!! Have recorded the steps I took to get to the point of leaving my office job and currently sticking it in a blog to help others who want to escape! nvm, just saw your followup. that’s great! So, what is it that you really want to do? I suspect Primal people will have the lowest recidivism rate. Once you feel the results you buy into it. The lifestyle kills the food cravings so only a complete fool would want to return to a SAD sick world. I am not strict Primal but I am a lot closer than I used to be, and I still agree with this assessment. There is nothing like feeling like warmed-over crap to scare you away from SAD for good. friday posts are such a favorite of mine! it was especially nice seeing where these guys & gals are now! Oh my goodness, I love these updates! Thanks for showing how well primal works for the LONG term! I love to hear how people are growing and changing for the good. Love the picture of the 3 boys looking silly, they also look content, well done! It’s so great to hear from the people who have been at it for some time, and wonderful to see that they’re still going strong! Thanks for the update! I love hearing how everyone is doing! haha! I wish I had more influence over my nephew’s diet! I keep trying to feed him egg yokes instead of those stupid little crackers – and they look at me like I’M crazy. There’s really no way to control what other people eat. I used to preach paleo until I was blue in the face, but I got tired of being considered a “food wacko”. Fortunately, my adult kids have listened to me. I’ve given up on everybody else. Really lovely to see updates on how people are getting on! One of the (many, many…) things I particularly love about Primal is how effortless it is to sustain. 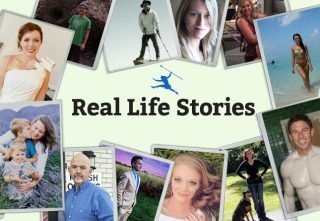 A far more heartening piece than some “where are they now?” stories you might see after weight loss success! Awesome! Glad to hear that folk are sill on the right track! All stories are very inspirational. I’m almost six months in, so this was a “blast from the past” for some of the people who influence me now. Sweet success continues! Tara’s blog is fantastic, and the Out of Milk app is one I seriously use daily to help me meet my goals. Thanks for all the awesome!!! Nice to see these updates. It leaves me very encouraged! I just have to say this…Albert, you look yummy! First you look amazing 😉 Second thanks for the tip on the inflammatory promoting omega 6’s. I have been primal for a few weeks but still battle severe and I mean SEVERE inflammation in the connective tissues at the base of my head, neck, shoulders, and feet. It seems to have gotten worse from switching to primal but I think it is because I am consuming too many nuts. Time to start tweaking I think 🙂 I only eat almonds and walnuts with the occasional teaspoon or two or peanut butter, but they are still consumed in excess. I will limit it the next few days to see if it helps. If it does I have you too thank! If you want to keep eating nuts, I’d suggest soaking them first. Mark has written on it in the past. Before going primal, I used to have a bunch of stomach issues. It was a mess. Everything kind of fixed itself after going primal. When I eat something that kills my stomach now, I know exactly what it is. Almonds did it for me. My girlfriend would make some raw almond “hot cereal” from the primal cookbook (which is delicious) but my stomach would balloon and I would be in pain all day long. I agree – it only takes 50 grams of almonds to get 6 grams of omega 6. That is sufficient omega 6 for an entire day. Paleo people often overdose. I feel so much better on a nut and seed free diet, plus a good dose of omega 3 each day – about 2000 – 3000mg EPA+ DHA. Dont forget the bone broth as well. Amazing for joint issues. A client of mine had great success with severe osteoarthritis. Inspiring–and while I am almost 100% primal, I can understand how people think we’re nuts not eating grains and bread and useless carbs. But when I turn 62 on July 12th, I will be an example of a “senior” who went from 186 to 168– and can sprint 3-4 times a week, run the hills, and has more energy than 95% of my fellow co-workers here, many who are in their 30’s and 40’s. Went out the other day with a few middle agers to run the hills…by the third hill I was out in front and all alone! Not cocky– just thankful for MDA and God’s grace in being able to feel like I am 19 every day with no aches, no pains, and no medicine other than good nutrition! 60 years of pain and misery, and a year or two of feeling young again…. sounds like a helluva graceful god. You need a new god, obviously, if that’s the best his ‘grace’ can do. Or, you could grow up and give up the fairy tales…. Anyone got a Grok club to bash jim in the head with? Stop being a troll, or take a long walk off a short cliff…. And as for the oh-so-erudite WTF, well, guess its on the same intellectual level as Pastor Dave’s original comment. None of you seem willing to address the issue: how does 60 years of pain, followed by a couple of feeling young again, constitute something for which to be thankful to a (mythical) supreme being? I’m glad Pastor Dave has found Primal and it’s doing him some good. It’s just simply inane to think his god should be considered Gracious for waiting 60 years to lead Dave to it. Not to mention the incredible irony of a Man of God (I presume) finding truth in an evolutionary approach to life. Ahh, the irony, and the joy of watching the logical acrobatics to justify that one in his own mind…. Seriously? Atheists who bash people on completely non-religious sites give the rest of us a bad name. PastorDave wasn’t being pushy or obnoxious in his faith. You’re free to disagree with him, and you’re free to act like a jerk over something that doesn’t matter. But next time you here comments about angry, unhappy unbelievers, ask yourself where Christians might get that idea. I’m an atheist as well, and you know what I hate most of all? people who try pushing their beliefs on others. Honestly have some respect. Was that really necessary? Having lived 15 years in chronic pain with the SAD diet and chronic cardio I am thankful for the last 15 months pain-free on the Primal lifestyle. Although I am an athiest and give credit to Mark’s hard work educating and my own determination I see no need to attack someone who finds their determination through religion. Kudos to you Paster Dave! I apologize on behalf of atheists for Jim. … I want to be a Personal Trainer and Nutritionist in Spain…. This is a real testament to the effectiveness of this way of life (we all know its more than just a diet). It works over the long run enhancing the quality of our lives. Great inspiration from everyone. I am just starting my primal journey and look forward to making my life/health better than it was before. BTW the out for milk app is great, bought it a couple of weeks ago. OMG Paul. I love Out of Milk. It is by far the best friggin app I have. Keep up the great work (personally and professionally). Congrats to all for their hard earned successes. Hi Tara! You look awesome. I am also 5’9″ and weigh 155. I would love to get down to 145 so if you don’t mind sharing, exactly what were your “tweaks?” Thanks and stay healthy! Hi Judith! I went to two meals a day (intermittent fasting every day, basically), cut dairy and alcohol out completely (went pretty strict Paleo, actually), cut BACK on my exercise and cut out nightshades completely. It took about a year. I probably wasn’t eating enough, as it was damn easy to gain those 10 lbs back (I’m not going to lie, some rice, quinoa and milk chocolate helped me gain it back). I am SO happy now, though. I had gone to a plastic surgeon who basically said I needed to be sliced in half and have my “pants pulled up and my shirt pulled down and be sewn back together, plus have a complete breast makeover.” My skin was just hanging off all over my body. Yikes. The weight has gone back to all the RIGHT places and I no longer need plastic surgery. 🙂 Are you SURE you want to get down to 145 at 5’9″??? 155 feels nice. That’s what I’m at in my original picture on MDA, where I’m standing in the backyard with the flower in my hair. OH! I almost forgot. I also cut out ALL nuts. And most fruit, except for berries. Now that I think about it, it wasn’t all that much fun. So, to gain it back, I just started eating…more. More often, more variety, more things with sugar in it, and I let loose more often. It’s way more fun and I feel better. Hi Tara! Thanks for responding to my post with great advice – much appreciated. I understand your point-one must find the balance between achieving/maintaining a particular weight and enjoying life i.e. that glass of wine! And I have to remember that little snacks add up. I enjoy your blog – thanks for keeping it going. Always cool to see people with similar stories who have succeeded. Sometimes in the middle of it, you can start to doubt yourself. Cool to see people doing what you are doing that are just a little further ahead. Thanks for sharing. I love BP! It’s the first time I’ve been able to relax and just live, not feeling constantly guilty when I ate over 1000 calories a day. These wonderful people are great examples for all of us. After losing 68 lbs, I still have waitresses trying to “help” me by recommending the “healthy” options on the menu. The skinny people who make snide remarks about fat people eating fat as I tuck into plates of Bacon and eggs. I think we are the luckiest people in the world for finding this way of life. this was just the boost i needed today 🙂 got the 21 day book yesterday, been feeling nervous about making the switch and sticking to it, but once again, coming to this site helps remind me of all the good stuff ahead! Way to go everyone! I read in at least two updates about local groups for paleo in general, whether it’s some kind of support group and/or one to help anyone find local grass-fed meats etc but I think that is key. I am finding it comical but a little frustrating that my best friend of 10 years, who introduced me to the idea of paleo diet (although someone else referred me to MDA), bought the PB book, cookbook, and 21-day challenge, but is resistant to the change and will almost scoff at me when I turn down an offer of potatoes (most times) or corn on the cob or ham and beans. Having support, although not always necessary for everyone, can be a big boost when you need it! This is a good community of folks from what I normally see, and I hope primal living grows and grows. Thanks, of course, go to Mark for keeping this up! I, like so many, am grateful! I love these stories. I know science is (slowly, it seems) catching up with what people’s experience has been telling us for centuries (that this way of eating works) but it’s this sort of publicity that is constantly needed to get the message across. Especially when articles like this appear: cracked.com. I love cracked.com but this just made me a bit depressed, because I know it’s not true, even if the current ‘studies’ show it – starving yourself doesn’t work, but eating like our ancestors (or even our great grandparents, as a commentor above said) does! Albert made an interesting point about carbs. Working with many people – I’ve also observed that many do better on a higher carb count. Often 200 grams or more to feel really good especially if they do a lot of high intensity exercise. Symptoms linked with too few carbs are poor sleep, poor exercise recovery, feeling physically tired, feeling cold, light headed especially during workouts, dry eyes. And interestingly poor appetite control. Adding more and more fat to try to stop being hungry, rather than adding in a sweet potato to the meal. Just my observations. Agreed. I start getting sick and my cycles get irregular at below 100g carbs/day. 150-200/day is my sweet spot I’d say! Of course, I’m also a Zumba instructor, so that may contribute some. OMG I Looooove Fridays (although in Aus-we have to wait until Saturday morning!). I only found Primal in January, so I hadn’t seen these before stories. I turn on my PC and there were 4 for the price of one! Woo hoo. And you guys all look fantastic. Such an inspiration to read that real people get real ongoing results and look so healthy! Thanks for the updates – now to find the time to read the original stories……….YAY! I think people are just getting better about seeing what works for them personally. I started out low-carb, went Primal and am now more towards Paleo because I can’t do dairy at all. However I do occasionally get a great quinoa, cashew and cranberry salad our local co-op makes and I do put a tbsp of peanut butter in my coconut milk curry sauce. Why do we need to fit an exact “label”? Adding in sweet potatoes and carbs is fine. Mark’s done several posts about “safe starchs.” Low carb is great for weight loss, but for maintenance people need to tweak the glucose intake for life performance. Once you reach your weight goals everyone’s carb sweet spot is different and again low carbs isn’t necessarily the way to go. I only mention this because you seem to be under the impression that adding in starch is not Primal. Having worked with most people- i realised that there is no one size fits carb intake for everyone. One factor to consider if whether one has been doing intensive workout. If yes, then the carb intake should be increased. If not, a deficiency in carbs can result in side effects. Just found this site while looking for a good carb calculator…looks like solid information and lots of enthusiasm! I am VERY disappointed that some people are using a health site for their Christian-bashing. Aren’t there enough other websites for that? When I don’t understand something, I either ask questions or keep quiet…not flaunt my ignorance around the world. If I can get good health information, wonderful. If I have to wade through a bunch of hate comments, it’s not worth it. Arlene, those are just trolls. No need to proselytize about understanding here, it’s a very very positive environment. Look through the site and you’ll see that encouragement is what this site is about. Lots of typos in this article….I never weighed 270lbs. Hahahahah, might want to fix that. Uh, I think Albert needs to try out for some modeling gigs. Wowza. I see a common factor between all of these people, they all are caught up in the idea of eating carbs. Your just confusing yourself with carbs and fat. If you can just move past that your performance will go through the roof and you’ll begin to see the true effects of being ketogenic (fat adapted). I personally eat fatty cuts of meat, lots of eggs, whole milk, and full fat greek yogurt. Notice none of these people above have any significant muscle mass. Listen people, paleolithic man ate 99% meat. You dont need grains, you dont need fruits(fructose is a nasty actor), you dont need vegetables, you dont need fiber, you dont even need dairy but its nice for the extra protien. If you recall from the marathon runners from before, they werent eating carbs and were very well built. Look at them and look at the people above. That’s ridiculous. Where did you get that idea? Its not an idea, its a fact. Obviously you haven’t read any of the material from the artic explorer Stefanssan. He ate nothing but meat for many years with improved health conditions. All of the other explorers had cases of scurvy, refusing to give up their grains and vegetable matter and the eskimo’s and other just lived off what they could hunt (the fat of the land) and they didn’t even have a case of scurvy. These people lived in cold climates, there wasn’t any kind of vegetable matter groving. There simply is just no need for those kinds of this and I personally view fiber as a huge detriment to our health. Mark fully understands all of this as well, he just allows people like yall to eat fruits and vegetables bc you people are so controlled by the medical establishment that you cant even fathom life without you berries and your salad greens. Call me crazy but in nature i would never go out greens that were growing out of the ground, its just crazy. Any kind of carb is going to be digested as glucose (blood sugar). I dont care if its blueberries of a piece of bread, its all sugar which as we know its the cause of all kinds of health conditions. And as for fructose, it is directly stored as body fat. Nobody has anything to say back to my last psot because you are all clueless except for what is in marks book. You have to look at the basic biochemistry of this stuff. All of this imformation is on the internet. Good sources in clude the work of Dr. Greg Ellis at byebyecarbs.com, Charles Washington at zeroinginonhealth.com, Owsley “the Bear” Stanley who ate an esclusive meat diet for over 50 years, and of course Vilhjalmur Stefansson the famous explorer. I don’t even know where to start when addressing your post…………it’s incredibly naive. Just a comment for Tara on the fructose intolerance/malabsorption. I was diagnosed 7+ years ago and the research changes frequently. There are also other classes of foods that cause similar issues. I would highly suggest doing the FODMAP elimination (I like the IBS Free at Last book – food lists are based on published research) to determine which foods and food types are actually the triggers. Some of the foods you listed (carrots) shouldn’t be a problem if it’s just a fructose intolerance. And having a clear idea of which classes bother you helps immensely. Thanks Melissa, I read that carrots are a source of fructans, as are tomatoes, artichokes, asparagus, garlic and wheat, and I have problems with all those things. I know I definitely have a problem with fructose, I have been doing experiments at home. I blow up like I’m 6 months pregnant after anything that is higher in fructose than glucose, but have some luck with taking glucose tablets 5-10 minutes before eating. So far I know I have problems with fructans, free fructose and polyols but I’ll read some more about the FODMAP diet. Thanks! Good luck. I also struggle with fructans, but I’ve never had a problem with carrots or tomatoes. Onions and cabbage however are a disaster. The best part of the FODMAP book is that it lists the foods for each type in order of amount so you can safely choose items to test and avoid. It can also be very dose dependent. For me and polypols – fake sugar (sorbitol) is a disaster, but a few cherries or mushrooms are fine. I too have fructose malabsorption and it’s killing me to not eat fruit. I’m pretty much down to lemons and tomatoes in terms of what I can eat. I suspect the high acid content is what makes it okay for me. So since we can’t eat fruit, and are also supposed to cut out processed sugar, what do you do for occasional sweets beyond dark chocolate? My go-to has always been Breyers Natural Vanilla ice cream (no HFCS) topped with Magic Shell (again, no HFCS). Angling away from fructose malabsorption to the whole female, 5’9, muscular, autoimmune issues and weigh a lot thing: Well, I’m female, 5’9, muscular, have an autoimmune issue and weigh a lot, lol. I hover between 175 and 180. I also have Graves’ Disease that turned into hypothyroid following radiation treatment. I currently take 137mcg Synthroid and am weaning off a low dose of Phentermine because no matter what I weigh, I can’t be on a legal form of speed for the rest of my life. I want to weigh in the low 160s. I have great muscle definition that I didn’t have before since upping my protein intake, but my weight is NOT budging. I’ve talked to my doctor and when I finish my current prescription, I’m going to try Armour (dessicated thyroid). That should help, right? Does anyone else have this problem and can shed some light on it? Im just stacking 300 lb tires up into trees for fun and Exercise..
Love to hear about people’s continued success just as much as I love continuing to succeed! LOVED THIS ARTICLE!! Awesome accomplishments everyone! PAUL!! I have had your app on my phone since about January or so. I love it! Congratulations on your success. I hope your knee continues to improve. But anyway congrats on all your successes! I hope I can become “primal” in a while, but for now I live with vegetarian parents (by religion) and they would be so upset if I ate meat I’ll wait until I move out in a few months. But for now I’ve done what I can to eat lots of egg and dairy, good fat, protein, and vegetables, while reducing my starch to sweet and regular potatoes.